I need to send my mother to this thread. She'll love it. I saw TFA with her back in January not knowing how she'd react, and my god if there's a bigger Reylo shipper than any of us here, she's it. She was just talking today about her reaction why Kylo first unmasked. Logically she knew he had to be young because at that point we knew who he was, but she wasn't expecting....that. He literally took her breath away. She's reading a Reylo fanfic I sent her this evening (Seldom All They Seem by ambiguously) but hopefully she'll have a chance tomorrow. He's such a beautiful Elf here. And looks about 12. You want to know something funny? This is the precise moment I thought a kiss was going to happen. The tension and startling lack of proper "fight" energy just made me think the lightsabers were going to fall uselessly to the ground and they were just going to start making out. 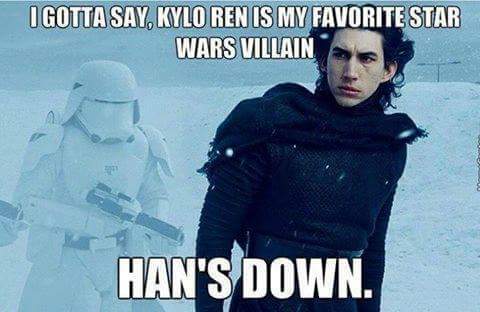 Choosing a favorite image of Kylo is like choosing a favorite child. The dark prince in the snowy forest. Yes, I like the 'end ones'. @Slade wrote: And Adam was just standing here, hanging out, when someone filmed him here. I doubt he even knew he was being filmed. Love it! BTW is he chewing his bottom lip? This definitely gives me the (naughty) warm and fuzzies. Are you serious? People say that to him? On TV? I really like that gif. It looks like it's in between takes, and Adam is still very much in character. The regality he projects is amazing. They phrase it a little "nicer" but yeah. Adam seems to have some pretty bad self-esteem issues when it comes to his appearance. One reason he initially was inclined to turn down the Kylo role is (from what I read somewhere) that he felt he wasn't attractive enough for the role. The regality Adam projects as Kylo is magnificent! I wish more men would take a hint from him and stop schlepping around in godawful nylon basketball shorts with Duck Dynasty tshirts and bad haircuts. Right? His everyday look is typically a pair of jeans that fit well, solid colored t-shirt, and a leather jacket. Simple and masculine and way more stylish than what 90% of 30-something men wear as an everyday look. Yes, and they should take a hint from Kylo in terms of how they carry themselves: stop mansprawling and woohooing and learn to project some regality and elegance. 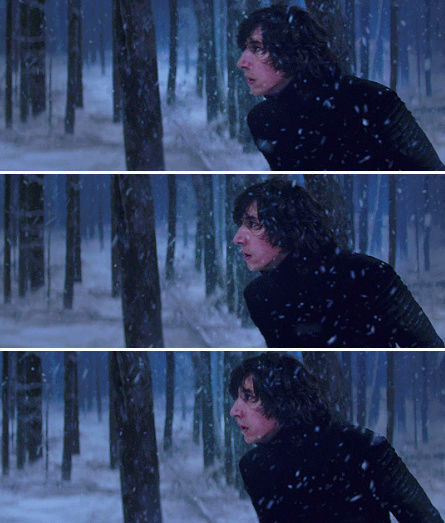 I mean, d*** ,Kylo even looks regal and elegant when he is chasing Rey through the snowy woods (well,up until she hands his a** to him on a platter). Shudder at the bolded, where was the upgrade in American male sartorial styles that we were promised would happen because of Mad Men? Hell, I tend to run in circles where the look is more lumbersexual and even that style is too schlubby for my tastes. But the nylon shorts and shower sandals you see in public make me wish that Queer Eye for the Straight Guy was still on the air (or that Tim Gunn would appear and give them a talking to). They need a full on intervention. Honestly, I'm not a fan of the preppy khaki shorts with polo shirt look either (though I like cold weather preppy clothes quite a bit as they are dark and cover one's body). Adam Driver wrote: "I just kept dressing like a 15-year-old until my wife was basically like, 'You know, you should wear long pants now. Maybe shorts are good for some people, but not you. And maybe you should get your toe looked at, 'cause, you know, it looks like a turtle shell.'" Ouch! Yes, let's have a moment of "Joanne and her tough love" appreciation! I wonder what was wrong with his toe? (Adam actually looks as good in shorts as anyone else, so I don't understand her implication that he looked especially bad in them, but whatever, she got him into well fitted jeans). Adam also deadpans stuff like "she taught me about cheese" or "I taught her about soap" so I never know how serious he is being when he mentions things like turtle toes. I just got back from grocery shopping. The supermarket on weekends is a great place to observe casual guywear. I think that nearly every guy in there was wearing cargo shorts and a geek t-shirt of some kind (I counted 1 Dr. Who, several Marvel, and several Star Wars t-shirts) OR a Seahawks t-shirts. In the PNW in the summer, I think everyone trades in their flannels for geek shirts. @ISeeAnIsland wrote: I just got back from grocery shopping. The supermarket on weekends is a great place to observe casual guywear. I think that nearly every guy in there was wearing cargo shorts and a geek t-shirt of some kind (I counted 1 Dr. Who, several Marvel, and several Star Wars t-shirts) OR a Seahawks t-shirts. In the PNW in the summer, I think everyone trades in their flannels for geek shirts. This is typical attire for south Louisiana. 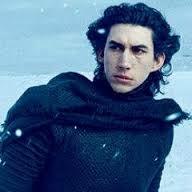 Here's a Kylo. That's much better! I may or may not have a framed print of this in my possession. I regret nothing. Ugh. It was always the excess Polartec fleece and Tevas with socks look that I remember from living up there.